In this trip report, I will not be covering on seat product, IFE and window shades as they have been covered in part 1. My original plan was to fly back to Taipei on the 5th of September. Before my trip to Taipei, I decided to extend one more day in Tokyo so that I could do some sightseeing in the city. I went down to the ANA Office at 80 Robinson Road near to Tanjong Pagar MRT station, the Japanese staff could only put me on waiting list and since I am using my EVA Air card, the chance is slim as the priority goes to ANA membership card members. I decided to take a chance anyway, but spending another day in Taipei wasn't a bad idea. In the end, I didn't get to change my flight. I had to fly off on the 5th September. I woke up early at around 5.30 am at the Aizuya Inn Hotel which is an hour from Haneda Airport. My flight was at 1005am but I decided to leave earlier, as I didn't want to take a risk of missing my flight. As I had earlier flown with JA815A, I was hoping for a different aircraft, perhaps JA802A the special livery aircraft. Beautiful isn't it? ANA has 2 aircraft with this colourful scheme. JA801A and JA802A. 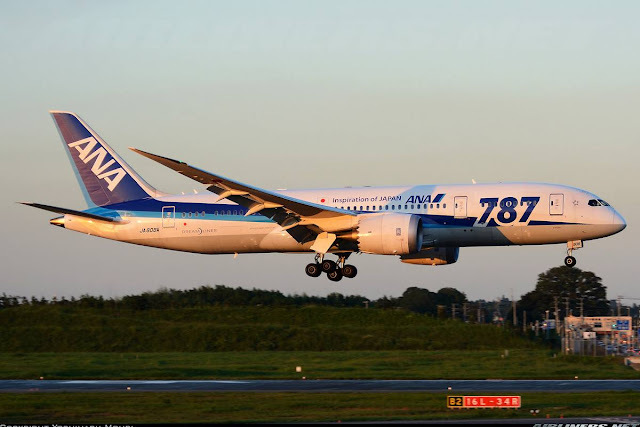 JA801A is the very first 787 aircraft delivered to any airline and it flies only on domestic route so that means JA802A is the possible aircraft that I could get. The interior of these aircraft are the same though, just that flying on a aircraft with special livery makes it some kind of special especially for your flight logbook. The only way to find out was to go to the gate! I knew one thing for sure, its very unlikely the aircraft would be changed for another type. There would always be a spare lying around somewhere. Anyway, I left the hotel at 6 am, took the Hibiya line to Ningyocho where I changed for the Asakusa line which took me to Sengakuji and finally from there, I took the monorail train to Tokyo Haneda Airport domestic terminal to pick up my luggage. I decided to leave it there the day before so that I won't have to carry it all the way to the hotel which is a hassle! Getting around from terminal to the other is easy, there is a free shuttle bus that would take you to another terminal. The waiting time is about 10 minutes and it gets you there fast. There are signs to show you around in the terminal and you are unlikely to get lost. If you are, just ask the Japanese staff, there are more than glad to help you. This was where I did my check-in. I wanted to skip pass the self check-in kiosk but a staff came and told me to use it before checking in my luggage at the counter. That meant that I had to settle for this boarding pass. My experience at Tokyo Haneda Airport was a pleasant one. Between Haneda and Narita, I prefer to travel through Haneda Airport, as its more convenient and faster to get to town. Tokyo Haneda Airport is smaller in size compared to Tokyo Narita and there is public transport to town area, very accessible. You have a choice of taxi, public bus and subway. I would recommend the subway which you can take from the station at either the arrival or departure hall. The train map is very confusing, it took me quite a while for me to figure it out. Do take note there are different train operators which means if you change from one train operator to the other, you have to buy separate tickets. The gate where my aircraft would be departing from. At this time, there was an NH 777 and I had a brief shock, but later on I realized it was for another flight to Hong Kong. Boarding had started at that time and it was around 850. My flight is on schedule! Code-sharing with EVA Air, the newest member of the Star Alliance. After the 777 pushed back, my flight details were displayed and not long after, my aircraft was towed to the gate. JA808A was my ride. This aircraft had been doing this route for the past week! Digging out more info, I found out JA808A was the first 787 to do the Tokyo Haneda to Taipei Songshan flight. The 787 looks very smart at this angle! A new registration for my flight logbook! Earlier on, I saw JA815A and it was heading to Beijing Airport. This time I took the the seat behind the wing on the left hand side. I prefer this seating position of the aircraft. Once again, crappy weather and this time in Tokyo. It was raining quite heavily at this point but the traffic was not affected. Saw many take-offs at the runway adjacent to this row of gates. Besides my aircraft was NH's Boeing 777-200ER bound for anAsian route (Can't remember). Map seat is always important for aviation geeks like myself! Its quite easy to tell this is a 787 cabin, as the huge window gives it away! I was hoping for the rainbow lighting, but that didn't happen. Didn't take too many photos this time round as I had taken enough from my last flight. This flight was once again full and my seat partner this time was an elder Japanese businessman. We didn't speak at all during the flight but he didn't seem to mind my interest in the aircraft. My worry about taking photos in-flight is receiving complaints by some passengers and then end up being told not to take any more photos. (Happened to my friends before) However, once again I had no problem with it. This toilet is located between the 2 Y class cabin, it has window unlike the one at the rear. A photo of me on the 787 Dreamliner's toilet! Boarding was fast and the door (L1) was closed in no time. I saw the same Taiwanese aviation enthusiasts on my flight, however they didn't recognize me. Pushed back was on-time and we taxied to runway 16R for a quick departure. This time, the ride was pretty bumpy for a good half an hour or so. The seat-belt was left on for that amount of time and even the crew were not allowed to start the service. However, it was not as bad as my peach's flight. Once the selt belt sign was switched off, the crew quickly got into action. They had to make up for loss time. The in-flight meal was served not too long after! Once again, I chose the Japanese option. I heard that the catering from Tokyo is quite good and this didn't disappointed. The rice was warm and the Soba noodles didn't disappoint. For an airline food, this is quite nice. For the dessert, it was bun with red bean paste in it, not bad. The in-flight service was great once again. The crew were charming and they were helpful in any way. Smiles were always on their faces. I have to say my experience with the Japanese carriers till this flight has been consistently good. One observation I noticed about the crew is that they always speak in Japanese first and then to English if the passenger is non-Japanese. After the meal was cleared, I enjoyed the rest of the flight watching a couple of movies and before I knew it, the aircraft started descending. Cabin crew came around to prepare the cabin for landing. I love the way they came about smiling at you and making sure everything was alright. On approach, the crosswind was quite strong, it was quite bumpy even through the weather was clear and we landed at runway 10. Taking off in this atrocious weather! The ride was bumpy until we were completely out of Japan. This part has to be the roughest! Never like flying through clouds. We had a good amount of shaking including some "down and up-drifts" due to unstable weather at this point. Almost out of the bad weather! Much better now! The air was much smoother than before even though there were occasional bumps. Weather in Taipei was fantastic, but the crosswind was strong, making it a challenging job for the pilots to stabilize the aircraft and touching down safely. Once again, we landed early, 20 minutes early. The flight simply went past too fast once again! Anyway, the aircraft parked at the same gate I departed from this airport. This flight was the first to arrive for the day. TSA-HND has 3 flights daily. This one is operated by Boeing 787, while the later flights were operated by Boeing 767. 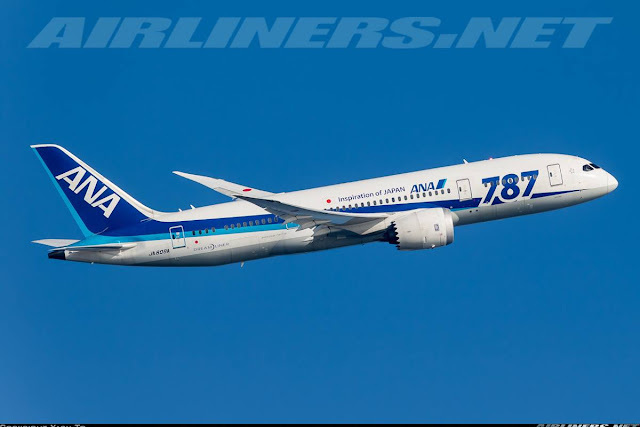 ANA will continue to fly the Boeing 787 beyond October 2013, there is no plan to change the aircraft type at least for now. There were many passengers taking photos of this beauty. Thank you JA808A for the wonderful ride! 2 of the Hello Kitty jets (EVA Air) fly to this airport too. The building itself has free-wifi at almost every part of the airport, but you have to switch wifi server when you move around the building. There is however no need to register to access. There are a few restaurants at the 1st level, 2nd level and the lift/escalator leading to the observation deck on the 3rd level. This can be found in between the 2 terminals in the same building. There are signs everywhere and its not hard to find the place you want to go. If you are a plane-spotter, there are few spots to photograph in the terminal. For land-side, you can head to the observation deck to enjoy the apron and runway view while at the air-side, the departure hall has plenty of windows where you can photograph until you are satisfied. The traffic may be quiet, but you can get some good stuff during the day especially in the early afternoon. Normally runway 10 is in used, but runway 26 can be in used occasionally, this depends on the wind condition. If you have any questions, feel free to leave a comment here and I will try my best to answer. Its always good to have first hand experience. I am glad to finally gotten my first taste of this next-generation aircraft with one of the top airlines in the world. Does the aircraft live up to its name? Despite its problem earlier on with the Ion-battery, electrical issues and others, the aircraft in terms of passenger comfort is better than the older generation. There are some new features that may or may not impress the passengers especially frequent flyers or aviation enthusiasts. For me, I like the new features such as the ones at the toilet, the electronic window shade and the size of the windows. That (electronic window shade) can be further improved. The ambiance of the cabin with the Boeing Sky Interior and the humidity in the cabin at high attitude are obvious improvement. The cabin noise is lower than the Boeing 777 but the A380 wins in this area. Take-off performance is impressive and the Roll Royce distinguish sound is recognizable during start-up and take off. Personally I feel the 2-4-2 suits this aircraft best. I haven't experience the 3-3-3 Y class configuration, but when I do I will comment on it. I hope that the current issues are eventually ironed out and an improvement in he 787's dispatch reliability. New aircraft bound to have such issues so don't worry about flying on one. I have confidence in Boeing despite the problems. The money I paid for is worth every cent. I have enjoyed this trip experience very much. Its something that an aviation enthusiast will not forget for a long time! The overall experience is definitely a positive one and I would definitely recommend anyone to give both ANA and the 787 dreamliner a try. Even if you can't fly the 787 dreamliner, try the airline for long-haul! The Y class product may not be the best, but the Japanese hospitality will definitely win your heart. Thank you for reading my part of the trip report!